DTS Internet Solutions is a freelance ran business based in the North East of England. With over 5 years experience working within the Internet Advertising Industry, I have a great knowledge of all aspects of online Advertising and Website Design. We believe that web hosting is more than just providing web space and FTP access. Our aim is to provide individuals and businesses with everything they need to express themselves on the internet, be that through an idea or selling goods and services. Whatever you want to create a website for, be it a small family photo album or a full powered data base driven ecommerce website, your choice of web host is essential. The right web host will make the difference between a slow clunky site that has regular down time and a site that is always available and blisteringly fast! Our purpose built web hosting infrastructure is unrivalled in the UK for stability and reliability. Our support database provides the answers to the majority of web hosting related questions and if you need to get in touch we are on hand to answer any questions you may have. Because all of our hosting technology has been developed by us in-house we don't have any expensive licensing fees to pass on to our customers. That means we can offer you more for less! We believe in developing highly automated systems giving customers complete control of their web hosting. Our web hosting control panel is one of the most advanced available today. Our web hosting is ideal for a beginner starting their first website through to SME's demanding their own powerful ecommerce solution. We take our customer's security very seriously and all software is upgraded within 24 hours of new patches being released. We only use Dell servers in our web hosting platform. Our platform is designed to be highly redundant and all data is stored in network disk arrays. Data is automatically synchronised between the arrays so that in the event of an array failing the remaining array continues to serve data to the servers with no downtime. Each array is also backed up each night to a separate backup cluster which is then written to tape and stored offsite. We utilise uninterruptable power supplies and an n+1 generator setup to ensure constant and clean energy to our infrastructure. The data centre is protected by fire suppression, monitored by CCTV both externally and internally, has 24x7x365 onsite security and the building is surrounded by an 8ft perimeter fence. We are automatically informed of new security patches via our vendor. Patches are applied within 24 hours. Our own platform is scanned each month for application vulnerabilities and we use a network scanner to identify weaknesses in our network. More than we can list here! 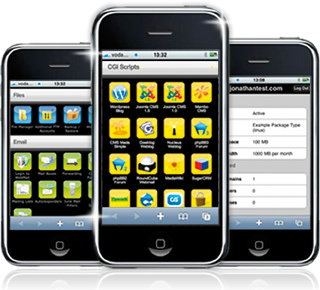 Customers can also manage their websites and hosting accounts on the move with our exclusive iPhone control panel which has all the same functionality of the standard control panel. This is free for all our web hosting customers. We want our hosting customer's websites to be a success and with this in mind we also provide our hosting customers with one of the biggest CGI script libraries in the UK including one click install WordPress, Joomla, phpBB, BuddyPress, OpenX & Drupal. A term used by web hosts to describe how much data can pass from the server your website is hosted on to people visiting your web site. This includes the files that make up your website as well as any data downloaded from databases or media files. A country code top level domain name. These domain names are associated with a country or geographic location e.g. .co.uk (UK), .fr (France and .cn (China). The ability to register these domain names from another country depends on the registrar's rules. For example, co.uk has no restrictions whereas .it (Italy) demands you are based in Europe. The system that maps domain names to the corresponding machine's IP addresses. This system is essentially a phone book that translates human friendly names into computer friendly numbers. Because this information is stored across multiple computers any updates to a domain (including registration and ownership details) can take up to 48 hours to work its way across all of them. Once you are ready to see what your website looks like online, uploading the files to your web space is really easy and is often as simple as clicking, dragging and dropping. The method you will use to get your website online is called File Transfer Protocol (FTP). Don't be put off by the name, all this does is take the files from your computer and put them on to the web host's server for people to access. Simple! In order to do this your web host may offer an upload function though your account with them, but that means you have to log in every time. 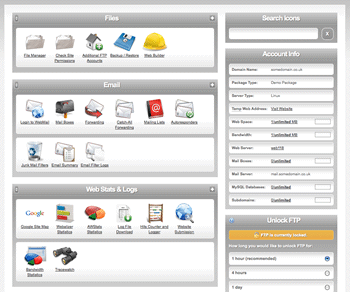 A quicker alternative that most people use is FTP software. Some HTML editors come with this built in (e.g. Dreamweaver & Microsoft Expression Web) but even if yours doesn't there is the industry standard stand alone (which is free) to download called FileZilla. HTML (Hyper Text Mark-up Language) is the first layer of a web page and deals with the content (the text, any lists, tables, quotes...). MySQL (owned and developed by Sun Microsystems) is the world's most popular open source database. It is also part of the open source software stack known as LAMP (Linux, Apache, MySQL, PHP). Top Level Domain Names have no association with any countries and were amongst the first to be created. E.g. .com, .net, .org. The amount of space allocated to your website by a web host to store all your files and data. The more web space you have the more information you can store. Copyright DTS Internet Solutions 2011©. Simple theme. Powered by Blogger.